All 50 states have laws prohibiting discrimination, with discrimination defined as an action that denies social participation or human rights to specific categories of people based on prejudice. Title VII of the Civil Rights Act of 1964 makes it illegal to discriminate against or harass someone on the basis of a protected characteristic. Racial / Ethnic Discrimination – it is illegal to harass or discriminate against a person because of that person’s race, ethnicity, or color. This type of discrimination includes treating someone unfavorably because that person is married to or associated with a person of a certain race, ethnicity, or color, or even when the victim and the person who inflicted the discrimination are of the same race, ethnicity, or color. Sexual Discrimination (also see sexual harassment) – the Equal Pay Act requires that employers give men and women equal pay for equal work as well as jobs that require equal skill, effort, and responsibility. Age Discrimination – the Age Discrimination in Employment Act (ADEA) prohibits discrimination (in all terms and conditions of employment) to employees who are at least 40 years old and applies to private employers who have at least 20 employees. Disability Discrimination – the Americans with Disabilities Act (ADA) prohibits discrimination to people with disabilities in any aspect of employment, as well as protecting those who are wrongly perceived as having a disability. Religious Discrimination – it is illegal to discriminate against a person because of their religion, and this includes harassment, employment, segregation, reasonable accommodation, and dress and grooming policies. National Origin Discrimination – the Immigration Reform and Control Act of 1986 (IRCA) prohibits discrimination against both employees and potential employees on the basis of their national origin and / or citizenship. The IRCA also states that it is illegal for employers to knowingly employ individuals who are not authorized to work in the United States. Marital Status Discrimination – although federal law does not prohibit discrimination on the basis of an employee’s or applicant’s marital status, about half of the states do have laws prohibiting this type of discrimination. Pregnancy Discrimination – the Pregnancy Discrimination Act (PDA) prohibits discrimination against individuals who are either pregnant or intent to become pregnant. 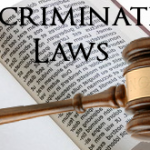 Contact LegalHelpLawyers.com today to get in touch with an experienced discrimination attorney!